Christopher Steven Tillman (born April 15, 1988) is an American professional baseball starting pitcher who is a free agent. He made his Major League Baseball (MLB) debut with the Baltimore Orioles in 2009, and played with them until 2018. He was named an All-Star in 2013. In baseball, a starting pitcher or starter is the first pitcher in the game for each team. A pitcher is credited with a game started if they throw the first pitch to the opponent's first batter of a game. A pitcher who enters the game after the first pitch of the game is a relief pitcher. Starting pitchers are expected to pitch for a significant portion of the game, although their ability to do this depends on many factors, including effectiveness, stamina, health, and strategy. Tillman was drafted by the Seattle Mariners in the second round of the 2006 Major League Baseball Draft. Adam LaMarque Jones is an American professional baseball outfielder for the Arizona Diamondbacks of Major League Baseball (MLB). He previously played in MLB for the Seattle Mariners and Baltimore Orioles. Baseball America is a sports magazine that covers baseball at every level, with a particular focus on up-and-coming players in high school, college, Japan, and the minor leagues. It is currently published in the form of a bi-weekly newspaper, five annual reference book titles, a weekly podcast, and a website. It also regularly produces lists of the top prospects in the sport, and covers aspects of the game from a scouting and player-development point of view. The publication's motto is "Baseball news you can't find anywhere else." On July 29, 2009, the Orioles selected Tillman's contract from Norfolk, and he would make his major league debut against the Kansas City Royals. He pitched 4​2⁄3 innings, allowing three runs on three solo home runs. The Orioles ended up winning 7–3, leaving Tillman with a no decision. Tillman's best start of his rookie campaign came on September 16 against the Tampa Bay Rays. In a tough-luck no decision, Tillman tossed 6​2⁄3 of one-run ball, while only allowing five hits. The 2009 Kansas City Royals season was the 41st season for the franchise, and their 39th at Kauffman Stadium. The season began on April 7 with a game against the Chicago White Sox at U. S. Cellular Field, which Chicago won. On April 10, the Royals hosted the New York Yankees in the first game at the newly renovated Kauffman Stadium for the Royals' home opener. Interleague opponents included the St. Louis Cardinals, Arizona Diamondbacks, Cincinnati Reds, Houston Astros and Pittsburgh Pirates. Tillman finished the year, making 12 starts and posting a 2–5 record with a 5.40 ERA. On March 30, the Orioles sent Tillman to the Norfolk Tides. On April 28, 2010, Tillman threw a no-hitter at the Gwinnett Braves as the Triple-A Norfolk Tides won the game 6–0. This no-hitter was the first for the Tides since 1992. On October 1, Tillman struck out a career-high seven batters against the Detroit Tigers. Tillman was optioned between the majors throughout 2010 and Tillman started for the O's during the 2010 campaign. He once again posted a 2–5 record with a 5.87 ERA in 11 starts. On April 2, 2011, Tillman carried a no-hitter through six innings against the Tampa Bay Rays in the Orioles second game of the season. He was lifted by manager Buck Showalter after the sixth inning, however, as Tillman's pitch count was already up to 101 pitches. The team no-hitter was lost the following inning by Jeremy Accardo but the Orioles did go on to win 3–1. The Orioles did not score their runs until the 8th inning, giving Tillman a no-decision. Despite this good start, Tillman's inconsistency and struggle to get opposing batters out led to him making only 13 starts for the Orioles. He struggled with a 3–5 record and 5.52 ERA, and allowed opposing batters to hit .301 off of him. On March 31, 2012, the Orioles decided to option Tillman to the Tides rather than include him on their starting rotation. He posted an 8–8 record with the Tides in 16 games, pitching to a 3.63 ERA with 30 walks and 92 strikeouts. Tillman made his return to the Orioles on July 4, 2012, allowing only 2 hits over 8​1⁄3 innings against the Mariners and recording his first major league win of the season. Tillman had his breakout half and went on to make 15 starts, posting a 9–3 record with a 2.93 ERA in 86 innings. He was able to hold hitters to a .207 average and he had a 1.05 WHIP. On March 17, 2014, manager Buck Showalter announced that Tillman would be the Orioles' Opening Day starter, for the first time in his career, on March 31, against the Boston Red Sox. He received a no-decision, going 5 innings, allowing one run, and striking out 4. On April 6, Tillman earned his first win of 2014, going 8​1⁄3 innings against the Detroit Tigers, allowing one run and striking out 5. On May 17, Tillman pitched his first career complete game shutout, against the Kansas City Royals. Tillman made his first career postseason start during Game 1 of the American League Division Series, against the Detroit Tigers. He was the winning pitcher, going 5 innings, allowing 2 runs, and striking out 6, as the Orioles defeated the Tigers 12–3. The Orioles would eventually get swept in the 2014 American League Championship Series. Tillman finished the season with a career-high 34 starts, 207​1⁄3 innings pitched, and a 13–6 record. His 15 no decisions were the most among MLB starting pitchers in 2014. He recorded a 3.34 ERA and 1.23 WHIP while striking out 150 batters. On May 7, 2015, Tillman surrendered a home run to Alex Rodriguez, which moved Rodriguez into sole possession of fourth place on the all time home run list, surpassing Willie Mays. After struggling greatly in the first half of the season, Tillman started off the second half of the year with one of the most dominant starts of his career, going eight innings, allowing only one hit and no runs, including retiring the last 23 batters he faced, against the Detroit Tigers. In addition, it was Tillman's fourth career outing in which he had allowed one or fewer hits over the course of six-plus innings. In his very next start, he pitched 7.0-plus innings and didn't give up a run until the seventh inning, ending his career-high 16-inning scoreless streak. In his third post-All-Star start, Tillman continued his dominance with a no-run, four hit, 8​2⁄3 inning performance. His season ERA was lowered to 4.35 (it had been 5.40 going into the second half). However, Tillman struggled through the rest of the season, as he finished 11–11 in 31 starts with a 4.99 ERA. The Orioles finished 81–81 and missed out on the postseason. Tillman was named the Orioles Opening Day starter for the third consecutive year in 2016. Due to two separate rain delays, Tillman was only able to throw two complete innings. 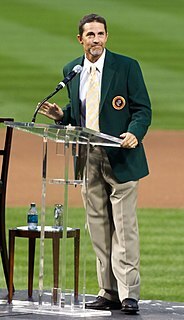 However, he struck out the final five batters he faced, and the Orioles went on to win in the bottom of the ninth 3–2, giving them their sixth consecutive Opening Day victory under manager Buck Showalter. Tillman pitched to a 2–1 and 3.24 ERA in the month of April and seemed to have his consistency, which he lacked in 2015, back. In May, Tillman went 5–0 in six starts, pitching to a 2.72 ERA in 39​2⁄3 with 37 strikeouts. In addition, he held opponents to a .197 batting average. On June 8, Tillman pitched his best game of the year, going 7​1⁄3 shutout innings, walking no batters, and tied a career-high with nine strikeouts. It was Tillman's 3rd game on the year with nine strikeouts, and his fourth start pitching at least seven innings. At the All-Star break, Tillman had compiled a 12–2 record with a 3.41 ERA in 113​1⁄3 innings, while striking out 98 batters. On July 21, after tossing seven innings of one-run ball to snap a four-game losing streak for the O's, Tillman recorded his 14th win of the season. He became the first Oriole pitcher since 2003 to win 14 decisions in their first 21 starts. The O's improved to 18–3 when Tillman was pitching. After battling injuries late in the season, which included a DL stint, Tillman's season ended, having greatly improved on his disappointing 2015 campaign. He compiled a 16–6 record in 30 starts with a 3.77 ERA in 172 innings pitched in 2016. He struck out 140 batters with a 1.29 WHIP, while allowing a career-low 19 home runs. On October 3, Tillman was named the starting pitcher for the Orioles Wild Card game against the Toronto Blue Jays. Tillman tossed 4​2⁄3 innings, allowing just four hits and a walk, along with two runs, while striking out four batters. Tillman left the game with runners on the corners, and teammate Mychal Givens came in and induced a double play. The Orioles would go on to lose 5–2 in 11 innings. After starting the first month of the season on the DL due to a shoulder injury, Tillman made his season debut against the Chicago White Sox on May 7. He tossed five scoreless innings and earned his first victory of the year as the Orioles would win 4–0. The win was Tillman's 73rd career victory, tying him with Sidney Ponson & Lefty Stewart for 20th in franchise history. For the season, Tillman endured his worst season in his career, as he was mostly ineffective and injured throughout. He finished 1-7 with a career worst 7.84 ERA in 24 games, 19 starts. On February 19, 2018, Tillman and the Orioles signed a one year contract for $3 million. After struggling through his first four starts, Tillman pitched seven one-hit, shutout innings against the Tigers to earn his first win in 27 appearances dating back to May 2017. He moved in to 20th place on the Orioles All-time win list. On July 20th, 2018 he was designated for assignment. Tillman elected free agency on July 25, 2018. On August 2, 2018, Tillman signed a minor-league contract with the Texas Rangers. He elected free agency on November 2, 2018. Tillman throws four pitches: a four seam fastball at 91–95 MPH, occasionally touching 96, a cutter at 83–87, a curveball at 75–78 that reached 80 during the first month of his career and a changeup, thrown mostly to lefties, at 78–84. The curveball and changeup are Tillman's out pitches. Dontrelle Wayne Willis, nicknamed "The D-Train", is an American former professional baseball pitcher. He played in Major League Baseball (MLB) for the Florida Marlins, Detroit Tigers, Arizona Diamondbacks and Cincinnati Reds. Willis was notable for his success during his first few years in the MLB and for his unconventional pitching style, which included a high leg kick and exaggerated twisting away from the batter. He was named the 2003 National League Rookie of the Year. Michael Cole Mussina, nicknamed Moose, is an American former baseball starting pitcher who played 18 seasons in Major League Baseball (MLB) for the Baltimore Orioles (1991–2000) and the New York Yankees (2001–2008). In 2019, he was elected to the Baseball Hall of Fame in his sixth year of eligibility. Mark Alan Buehrle is an American former professional baseball pitcher. 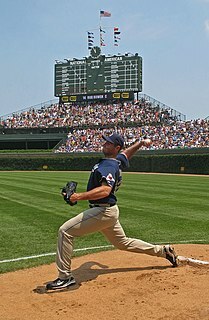 He began his Major League Baseball (MLB) career with the Chicago White Sox and started the opening game every season from 2002 to 2006 and again from 2008 to 2011. He also pitched for the Miami Marlins and Toronto Blue Jays. Buehrle pitched 200 innings in 14 consecutive seasons (2001–2014), tying Hall-of-Famers Greg Maddux, Phil Niekro, and Christy Mathewson. He recorded at least ten wins in 15 straight seasons. James Richard "Rich" Harden is a Canadian former professional baseball pitcher. He pitched for the Oakland Athletics, Chicago Cubs, and Texas Rangers of Major League Baseball. Jesse Harrison Jefferson was an American professional baseball pitcher with the Baltimore Orioles (1973-1975), Chicago White Sox (1975-1976), Toronto Blue Jays (1977-1980), Pittsburgh Pirates (1980) and California Angels (1981) of Major League Baseball (MLB). Jefferson batted left-handed and threw right-handed. He was best remembered as an inaugural member of the expansion Toronto Blue Jays. Yovani Gallardo is a Mexican professional baseball pitcher who is a free agent. 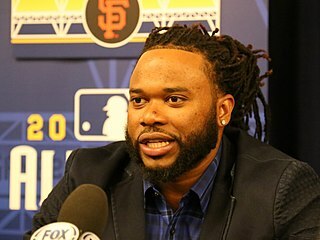 He was selected by the Milwaukee Brewers in the second round of the 2004 Major League Baseball draft out of Trimble Technical High School in Fort Worth, Texas. He has played in Major League Baseball (MLB) for the Baltimore Orioles, Texas Rangers, Seattle Mariners, and Cincinnati Reds. Derek Lane Holland is an American professional baseball pitcher for the San Francisco Giants of Major League Baseball (MLB). He previously played for the Texas Rangers and Chicago White Sox. He is nicknamed "Dutch Oven". Alberto Jose Alburquerque is a Dominican professional baseball pitcher who is a free agent. He has played in Major League Baseball (MLB) for the Detroit Tigers, Los Angeles Angels, Kansas City Royals, and Chicago White Sox. Dylan Matthew Bundy is an American professional baseball pitcher for the Baltimore Orioles of Major League Baseball. Bundy was drafted by the Orioles with the fourth overall pick in the 2011 Major League Baseball Draft. Kevin John Gausman is an American professional baseball pitcher for the Atlanta Braves of Major League Baseball (MLB). He previously played for the Baltimore Orioles and made his MLB debut during the 2013 season. Before his professional career, Gausman attended Louisiana State University (LSU) and played college baseball for the LSU Tigers. The Orioles selected him in the first round of the 2012 MLB draft. Philip Tyler Wilson is an American professional baseball pitcher for the LG Twins of the KBO League. He has played in Major League Baseball (MLB) for the Baltimore Orioles. Mychal Antonio Givens is an American professional baseball pitcher for the Baltimore Orioles of Major League Baseball (MLB). He made his MLB debut in 2015. ↑ "Chris Tillman Stats". Baseball Almanac. Retrieved November 26, 2012. ↑ "Chris Tillman – Player Profile | Perfect Game USA". www.perfectgame.org. Retrieved 13 January 2018. ↑ "Orioles trade Bedard to Mariners for five prospects". ESPN.com. Retrieved April 26, 2016. ↑ "BaseballAmerica.com: Prospects: Rankings: Organization Top 10 Prospects: Baltimore Orioles: Top 10 Prospects". November 5, 2008. Retrieved April 26, 2016. ↑ "O's set to unveil prospect Tillman". Baltimore Orioles. Retrieved April 26, 2016. ↑ "Orioles ride three-run seventh inning past Royals". ESPN.com. Retrieved April 26, 2016. ↑ Associated Press. "Chris Tillman dazzles in season debut as Orioles hold off Mariners". ESPN.com. Retrieved July 5, 2012. ↑ "Chris Tillman gets 15th win as Orioles down Red Sox". USA TODAY. August 29, 2013. Retrieved April 26, 2016. ↑ "Chris Tillman Statistics and History - Baseball-Reference.com". Baseball-Reference.com. Retrieved April 26, 2016. ↑ "After breakthrough year, Orioles RHP Chris Tillman named Opening Day starter". tribunedigital-baltimoresun. Retrieved April 26, 2016. ↑ "Pitching Game Finder: For 2014, Recorded no decision, as Starter, sorted by greatest number of games in a single season matching the selected criteria". Baseball Reference. Retrieved July 14, 2018. ↑ Joseph Zucker. "Alex Rodriguez Passes Willie Mays for 4th Place on MLB's All-Time Home Run List". Bleacher Report. Retrieved April 26, 2016. ↑ Steve Melewski. "Chris Tillman with an eight-inning gem as O's tame Tigers – Steve Melewski". MASNsports. Retrieved April 26, 2016. ↑ Todd, Jeff (August 2, 2018). "Rangers Sign Chris Tillman". mlbtraderumors.com. Retrieved August 3, 2018. ↑ "Player Card: Chris Tillman" . Retrieved April 26, 2016. ↑ "Orioles notes: New father Chris Tillman preparing for one more start before break; Davis rehab planned". The Baltimore Sun. Retrieved December 21, 2017. Wikimedia Commons has media related to Chris Tillman .